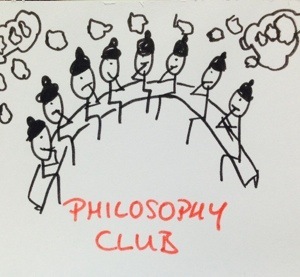 Dylan’s been selected for Philosophy Club – an elite club of eight 7yr old classmates lol! D: Mum, you shouldn’t watch too much TV, should you? Me: No – your eyes might go square. D: But that’s just a legend isn’t it? It’s not really real is it? It’s a LEGEND. Me: What do you think will happen if you watch too much TV then? D: Nothing. Your eyes will just go round like they already are. Me: Well, perhaps you’re right – but your brain might stop working properly if you watch too much TV. Me: You might stop having ideas. When do you have YOUR best ideas? D: When something’s gone wrong and I need to think of a way to fix it, so it doesn’t go wrong again. Me: OK, and do you ever have those good ideas whilst you’re watching the telly? D: No, because when I watch the telly I switch my brain off. Me: So if you watch the telly TOO MUCH, you’d stop actually DOING things and your brain wouldn’t need to come up with as many good ideas. D: Yes, my brain would just be switched off all the time and I would just say “erm, erm, erm” all day long and even at my birthday party I would still be going “erm, erm, erm…”!